tomorrow marks the first week on three that i will be spending back home in good old newbury park. so far, so good. i've been hanging with the fam and what friends i have left that are back from school. i have been spending much time with my gimp of a brother (he had surgery on his shoulder so had a huge sling he gets to wear everywhere). my mom and i ahve attempted seeing Fantastic Mr. Fox! twice now...the projectors never seem to work the days we chose though which is very upsetting, upside is we got free movie tickets for our troubles. Instead of seeing that we saw the Princess and the Frog which is pretty cute, not up to classic disney princess movies but it's still a good one. Wednesday night we had a big Jenga tournament which was fun, everyone was getting into it. 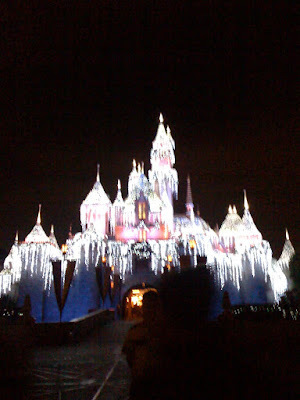 Thursday I went to Disneyland, the happiest place on earth and has a fabulous time. We saw the Pollock clan there and caught a few rides with them and Kelly brought Gavin and Owen to join the fun so i got to take them on some of the coasters which was really fun. I thought owen was goign to fly out of the seat on the matterhorn, i think i was more scared than he was on that one. Yesterday i got some christmas shopping done, saw Avatar, and went to an ugly sweater party. It's been a pretty busy week and has been really good, i'm excited to see what the rest of the break has to offer.